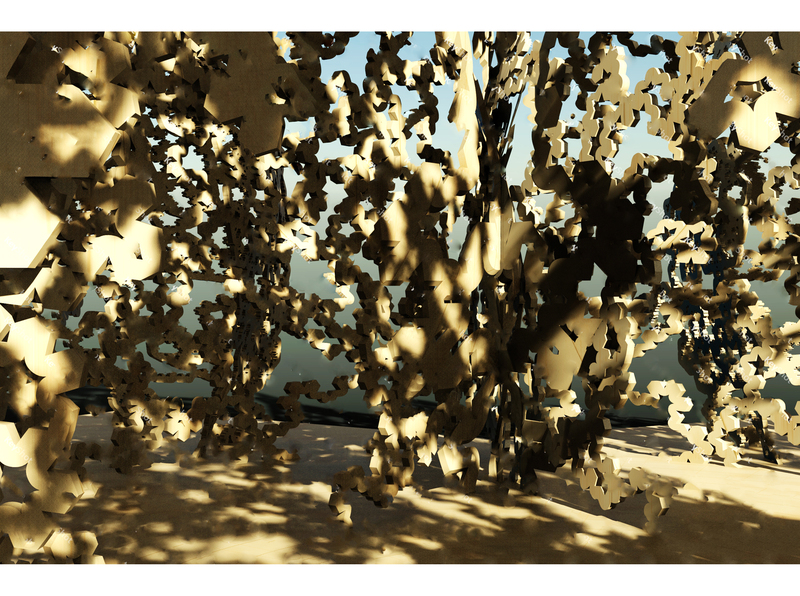 Since the last post on the 23rd October our students have been exploring how to materialise their research into fractals (which they generated with Mandelbulb3D). 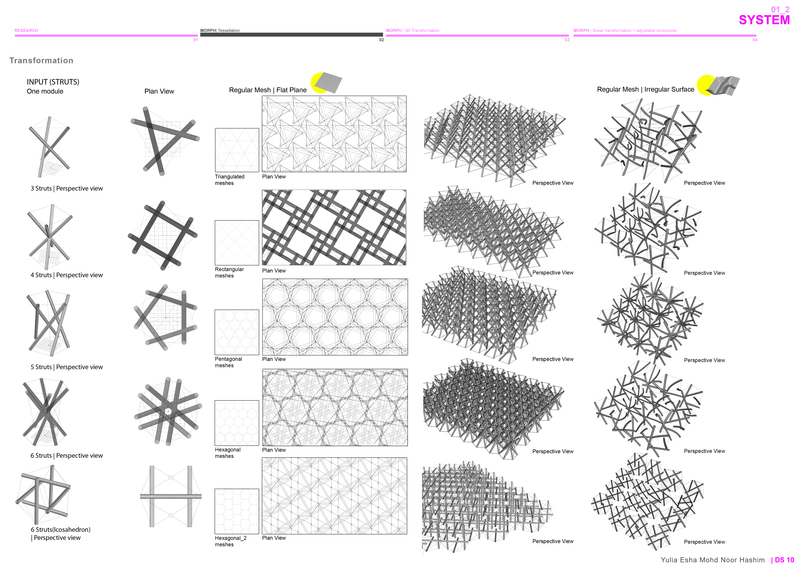 The conflict between endless geometry and finite material world creates a creative tension that pushes innovation in digital design and fabrication. 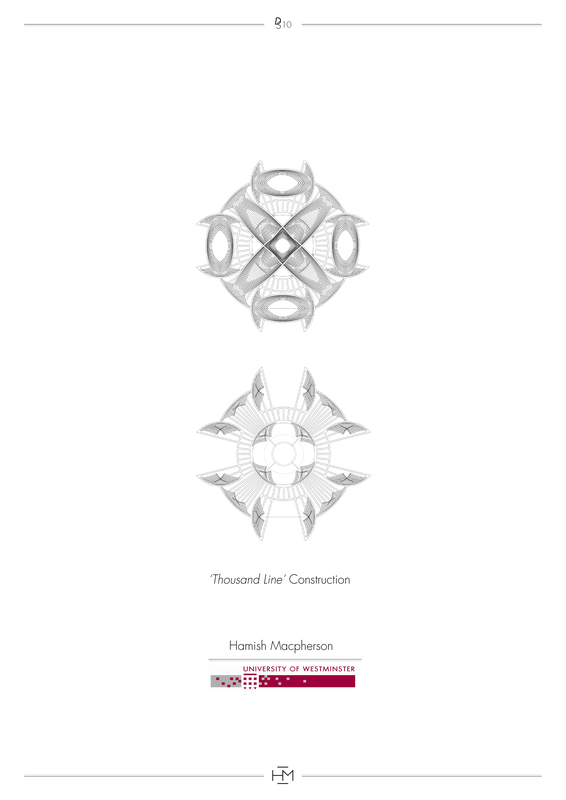 From parametric equations to parametric design, students have explored fractals as self-generating computer images and attempted to control them, first through changing their variables and then by extracting the most appealing fragments and recreating them using Grasshopper3D . From pure voxel-based images to NURBS or meshes and to 3D printing, laser-cutting, thermo-forming, casting..etc… students are confronted to the limitation of the computer’s memory and processing power as well as materials and numerical control (NC) programming language such as Gcode. 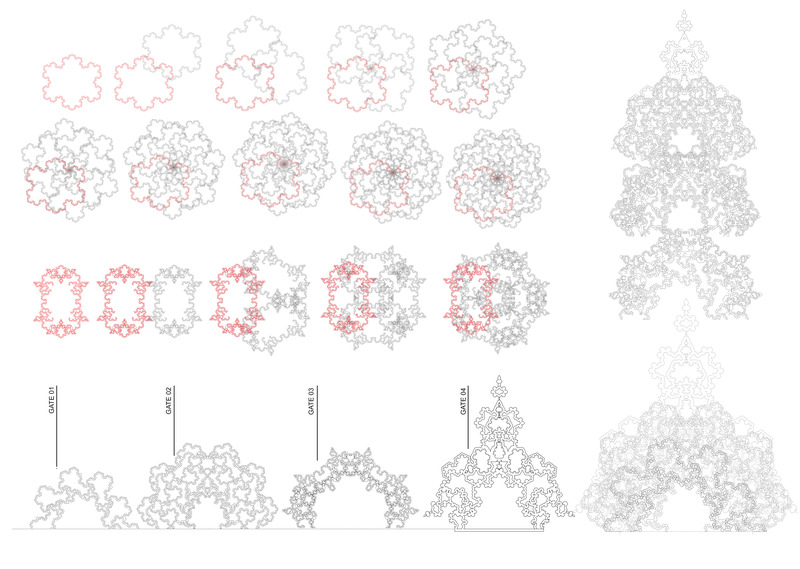 Navigating through fractals, exploring their recursive unpredictability to create more finite prototypes is like walking through the forest and noticing a beautiful flower to design your next building – it helps to let go of a fully top-down approach to architecture, it encourages a collaborations with your computer and a deep understanding of machines and materials. It anticipates a world in which the computers will have an intelligence of their own, where the architect will guide it onto a learning path instead of giving him instructions. Using infinite fractals to inspire designs helps instill infinity within the finite world – bringing a spiritual dimension to our everyday life. Henry McNeil’s Fibreglass modelling of the Apollonian Gasket. 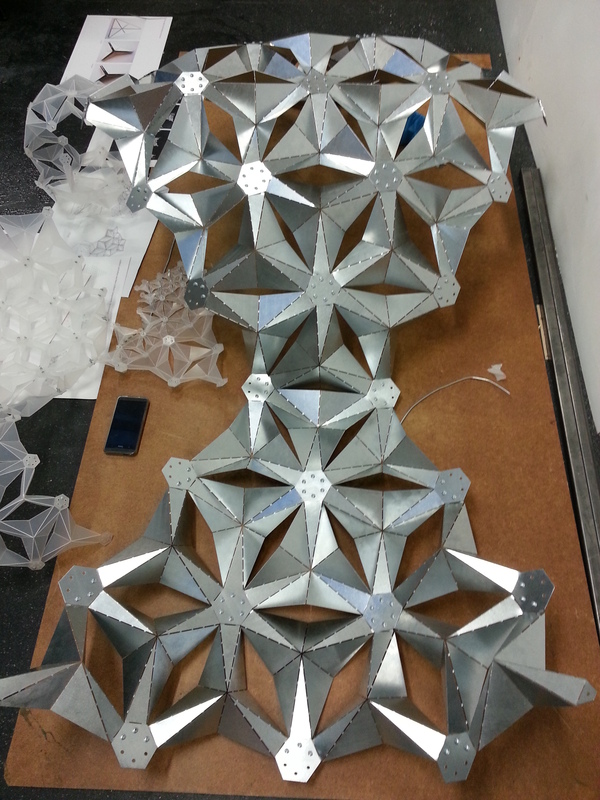 Ed Mack’s laser-cut Fractal Dodecahedron. Diploma Studio 10 is back with 21 talented architecture students from 4th and 5th year working on the Brief01:Fractals. 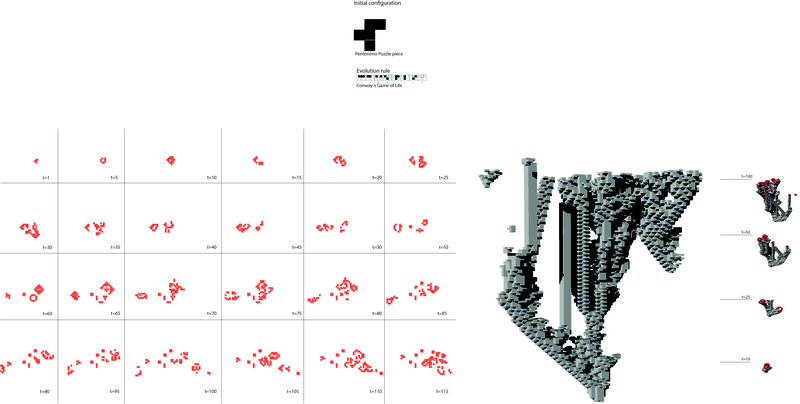 Here is an overview of their experiments so far after 4 weeks of workshops. Sara Malik’s Dodecahedron IFS Fractal (with Julia set) modelling with a handheld 3D printing pen. Ola Wojciak’s beautiful collection of Mandelbulb3D experiments using the Msltoe_Sym Formula with the Koch Surface. Beautiful twisting L-System from James Marr on Grasshopper3D using Anemone. 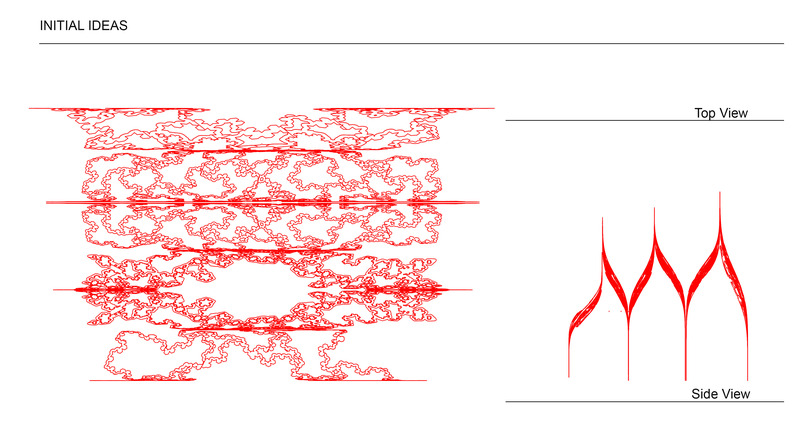 Manveer Sembi’s Aexion Fractal Matrix with Julia Set. Lewis Toghill’s Fractal Matrix using the cyripple , KalilinComb, sphereIFS, Isocahedron and genIFS fractals. Woodchip Barn, Hooke Park. and Wooden Waves, BuroHappold. The project is inspired by the interaction between people. It celebrates the female and male union and brings together people that already know each other or are completely strangers. Its interactive, it challenges its visitors, its playful. It invites people to take part and be interactive with each other. It is called like that as it challenges people to reach the final gate and come together. It acts indeed like a mistletoe. Mysterious and magical. The moment you stand beneath the final gate you stand where all the magic happens. You feel the power and need to kiss the other person. Its design celebrates this union and offers a magical mutation. It offers a labyrinth of complex, intriguing that seek to nourish individual experiences. Black rock city seems to be the promised land, the promise of freedom, of self-expression, of immediacy and creativity and community. 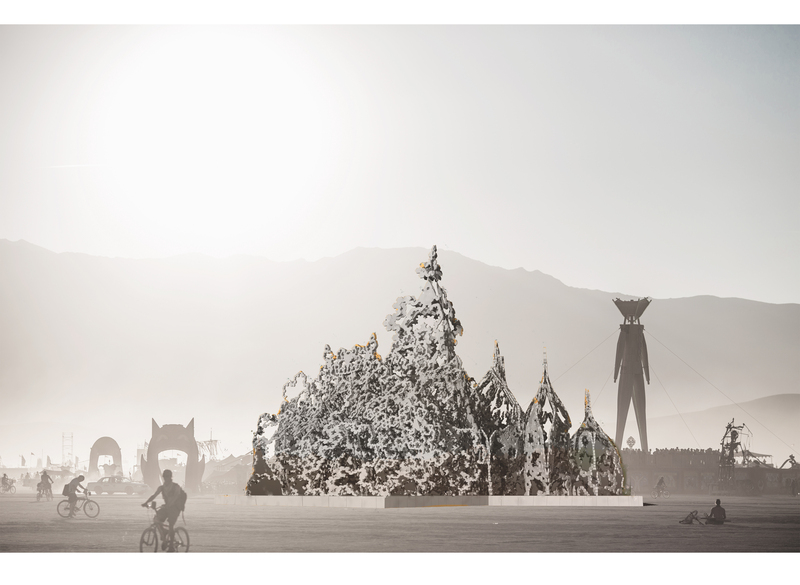 In a community like Burning Man you can assume the right to approach any random person and have an interesting interaction. You can overly express interest and curiosity. The Desert Mistletoe aims to give people a chance to be more expressed, more playful. Its for those people who want deeper connections, more meaningful interactions, less seriousness and more play. Hugs and affection are a particularly significant aspect in which to expect more from strangers. We all need love, hugs and kisses are one of the best ways to deliver it. Take the risk to go in for a kiss. Of course some people will be hesitant. The project challenges people to express affection and admiration and relax. Hugs and kisses bring us together. At Burning Man, the endless parade of people flaunting their unusualness brings joy and excitement. The unusual is both delightful and challenging. People love the unusual, the extraordinary and anything out of our everyday lives and routines. 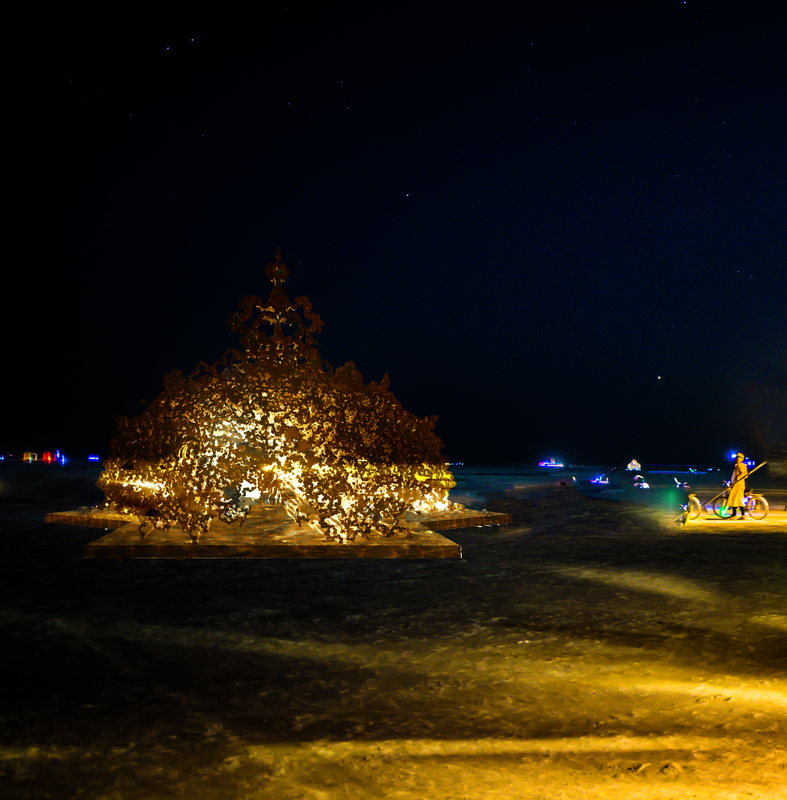 At Burning Man you do not need to sacrifice your wonderful weirdness. On the contrary you are challenged to explore your playful impulses and discover or express your freaky freedom. 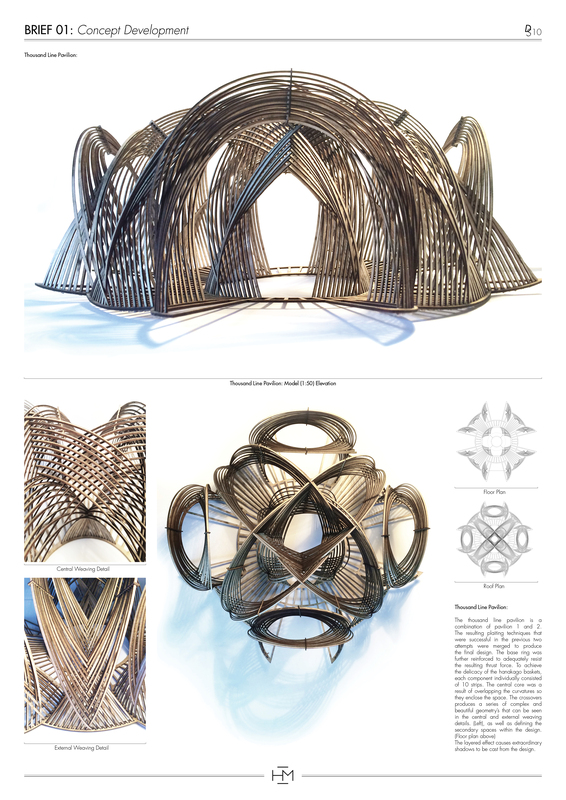 The project is inspired specifically by the people of Burning Man. 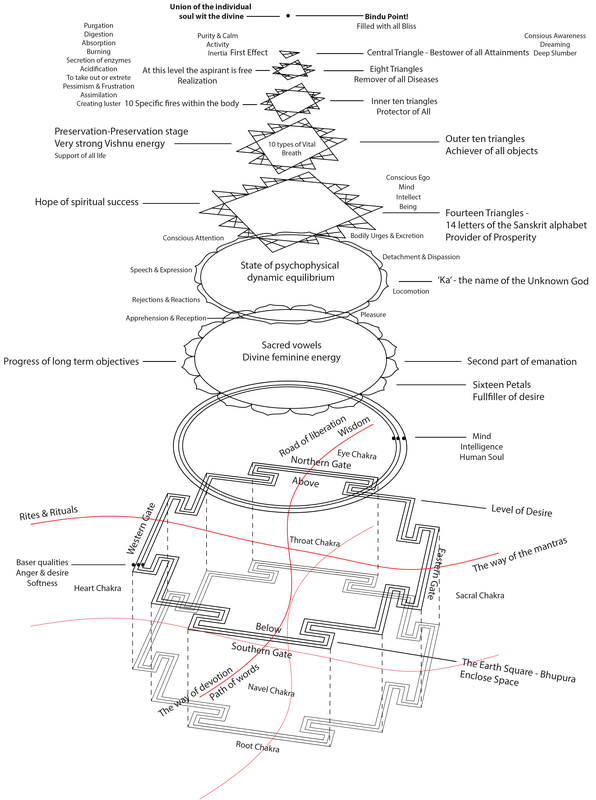 The Sri Yantra is conceived as a place of spiritual pilgrimage. It is a representation of the cosmos at the macrocosmic level and of the human body at the microcosmic level. It is a Journey. A spiritual journey from the stage of material existence to the union of the individual soul with the divine. The spiritual journey is taken as a pilgrimage in which every step is an ascent to the center. It represents a movement beyond one’s limited existence and every level is nearer to the goal. All the stages are within a gated frame, which is called the ‘earth citadel’ and forms an enclosed space. The symbol consists of nine interlocking triangles, centered around a bindu ( the central point). The five downward pointing triangles represent Shakti; the female principle. The four upright triangles represent Shiva; the male principle. 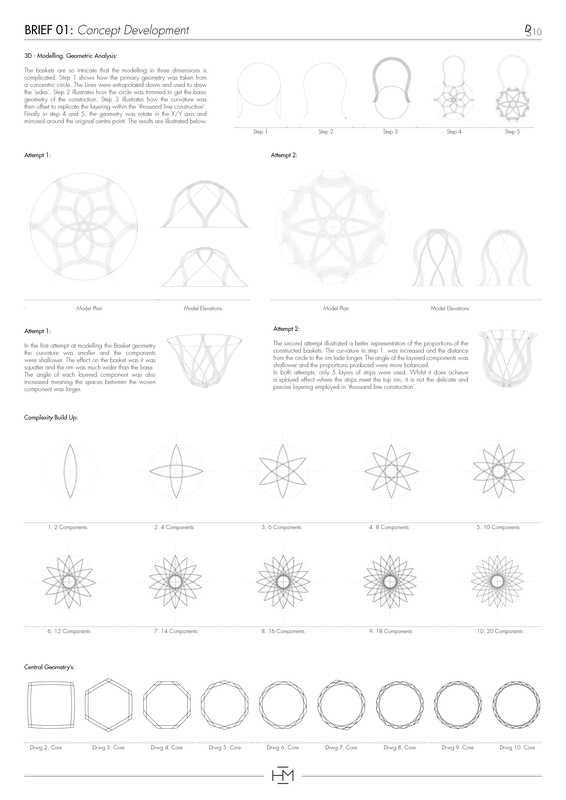 The nine interlocking triangles form 43 small triangles each representing a particular aspect of existence. 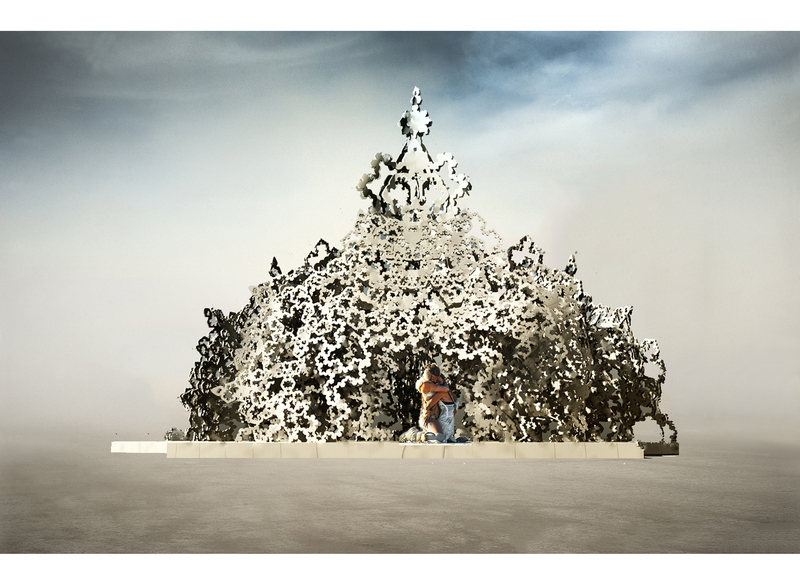 The proposed project is inspired by the concept of fractals – a never ending pattern, applied to a specific geometry. They are infinitely complex patterns created by repeating a simple process over and over, creating patterns that are self-similar across different scales. Fractals are images of dynamic systems that are driven by recursion. The idea is based on the Koch Snowflake, a mathematical curve which has a finite area bounded by an infinitely long line. For the project a script was created in Grasshopper and different patterns were created based on the triangles extracted from the Sri Yantra symbol. Together they represent, like the Sri Yantra symbol, the union of female and male. A celebration of our Creation. 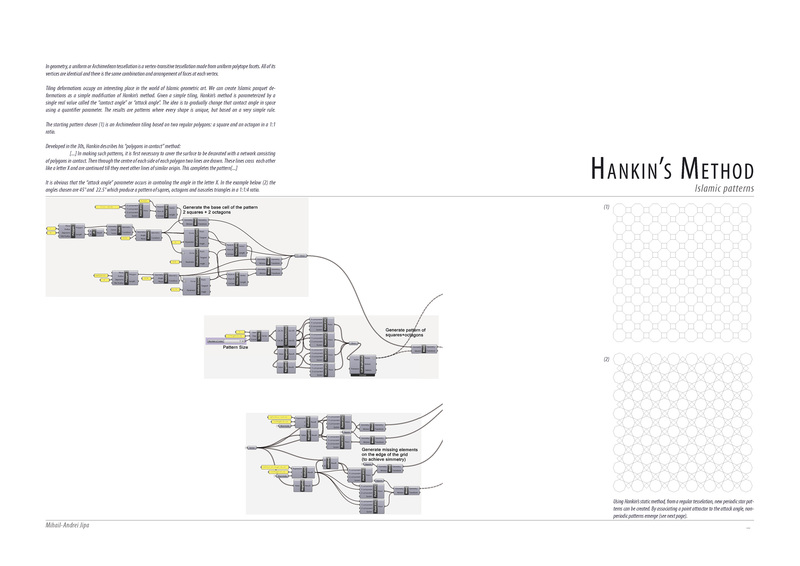 The initial idea was to extract some patterns and create something that will look like gates. Gates that could provide a journey to their visitors. Further development of the gates was undertaken. The final concept consists of 4 gates which intersect with each other in order to provide a journey. There are 4 different designs for each gate. Each gate has a dense pattern in order to create something elegant and ornamental. The pattern is based on the Koch snowflake concept and has been applied to multiple directions. The gates have different heights and dimensions with the last one reaching up to 10m height. This was designed in such a way to provide a climax of the visitor journey at the final gate/stage. The design is all about a journey. A personal journey with different experiences. A welcoming structure, inviting the visitors to interact with each other. It says a story, it represents a story and it invites you to create one. Experiment model in order to understand at what points the gates could intersect. At this point, the gates are connecting only on the top. This has as a result to have an ’empty’ structure on the sides. All the gates are connected with each other not only at the top but also on the sides. To achieve best results and better connections, the 3 gates are duplicated and connected with each other. The second gate will be connected with the third one only at the bottom. The 4rth gate has three sides creating a triangular central space. The gates have been rotated along the 2 other sides allowing for its visitors to enter from different directions. This also creates an enclosed space, like the Sri Yantra symbol. The proposed installation aims to be part of this beautiful journey of self-discovery. It takes part of expecting more from strangers, while noticing the weirdness of others and encourages everybody to express themselves. With expecting more of strangers it increases the likelihood that the people you meet will become a part of that sometimes elusive network of connections we call community.